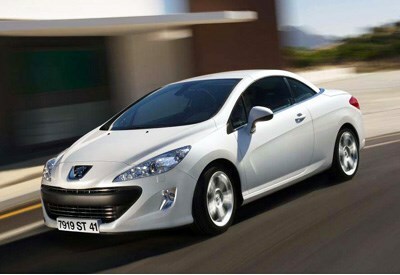 What is it: Peugeot's 307CC replacement and big brother to the 207CC. Highlights: Four-seater under Peugeot's latest-gen folding hardtop roof. Neat 'air scarf' system in the front seats which diffuses warm air around the occupant's shoulders and neck. And it's adjustable for temperature, flow and direction. Just the thing for top-down winter motoring. Australia-bound: On sale in April. Peugeot will confirm its position as the pioneer of coupé convertibles when it is the only maker with two different CC models at the Melbourne Motor Show this year. It will display both the 207CC and the soon-to-be-released 308CC at Australia's only major motor show for 2009, which runs from 27 February to 9 March at the Melbourne Exhibition Centre. Due to go on sale in Australia later this year, the 308CC promises to be a unique and attractive offer for enthusiasts of lifestyle motoring. With four full-size seats, the 308CC capitalises on all the inbuilt strengths of the 308 range whilst embodying the 307CC spirit and Peugeot's coup&eacute cabriolet expertise. Among the special features of the 308CC is a warm air system in the front seats, which acts as a scarf by diffusing warm air around the occupant's shoulders and neck, adjustable for temperature, flow and direction. Peugeot pioneered the concept of "folding roof cars" way back in the 1930s with its elegant 401, 601 and 402 "Eclipse" models, and it revived the concept for the 21st century with the hugely popular 206 CC. The 308CC is the latest of the Peugeot coupé cabriolets which have led the trend away from soft-tops to the comfort and security of metal folding roofs in affordable four-seat convertibles. It is scheduled for a mid-year launch on the Australian market to replace the successful 307CC and complete the 308 range of hatches and Touring wagons. Melbourne International Motor Show runs from 27 February to 9 March at the Melbourne Exhibition Centre and is organised and promoted by the Victorian Automobile Chamber of Commerce through its dealer division the Australian Automobile Dealers Association (Vic).